Blink and you?ll miss it ? unless you have what we call ?plumie-radar? ? in which case you can sense the presence of a thousand or more plumeria trees long before you get to the entrance. There is no sign, just a whole lot of plumeria trees. You are soon greeted by the barking of a pack of dogs, followed by a cheerful ‘Bonjour!' from Luc, who, together with his wife Carol, runs this sprawling nursery. The ‘Bonjour' is because Luc Vannoorbeeck hails originally from Belgium, but he has been in the United States for so many years that you might even detect a hint of an American accent in the occasional French word that we exchange!! Hop on one of the two golf carts, and just prepare to watch and listen; one of the great bonuses of coming here is that both Luc and Carol are always ready to take you on a tour. 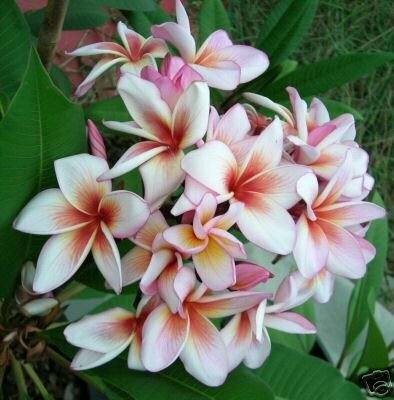 The Vannoorbeecks have been growing plumeria since 1993, the year after Hurricane Andrew completely devastated their hibiscus nursery in Homestead, Florida. Hibiscus have a lot of problems with pests, so they were looking for a change anyway. 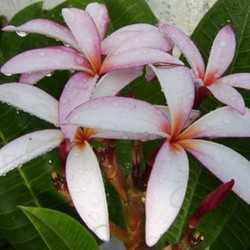 After attending a conference where he met Dr. Richard Criley, the notable plumeria scientist from the University of Hawaii, Luc placed a large order for plumeria cuttings from Hawaii and was on his way. 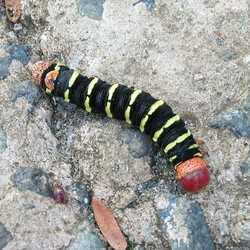 I asked him what he finds the most interesting thing about growing plumeria; he replies that it's an easy crop with very few known pests (one can be found in my article ‘Big Worms with Scary Teeth'), and...well, he LIKES them. 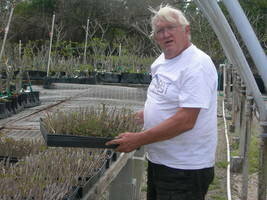 O ff to one side of the nursery is the ‘Grove' where all plumeria trees are planted in the ground. Here are their special seedlings for which they have become renowned: 'Abigail', 'Marion B', 'Pink Ruffles' and 'Lily Warmtoes' (pictured.) Too many to mention, but also a whole row of new seedlings (all children from the same parent as they believe in planting all the seeds from a pod to give good comparison material) are awaiting verification of the blooms, and eventually--if they live up to the high standards set by Luc and Carol--naming and registration. 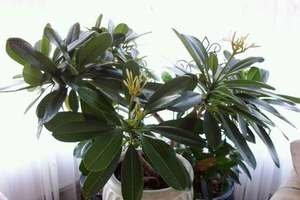 They usually find five or six new varieties each year worthy of propagation and selling. You might end up naming one yourself if you happen to be there on a day that they have a promising seedling in bloom. 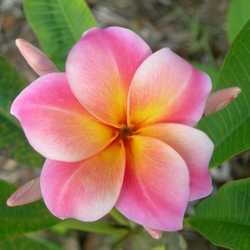 This is how ‘Henriette' (pictured) was named and eventually registered with the Plumeria Society of America. 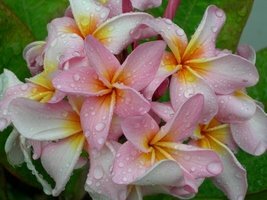 A lot has changed since they started out; Southeast Asia, most predominantly Thailand, has recently set about cultivating plumeria as a major business venture. Some fantastic new varieties are coming out of that area now, many of which are being imported into the U.S. They warn against some of the more wildly colored flowers that often carry a virus which could eventually weaken and kill the plant. W hile we meander through the Grove and the second part of the nursery, across the road, where the propagation takes place, Carol is back at the house talking on the phone to customers, or dealing with the e-mailed orders that have arrived. She is the business partner of the team; Luc has another very important function: he is a master grafter. 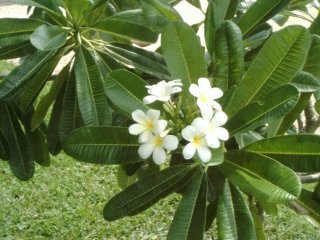 ‘Why would you graft plumeria when they are so easy to root?' I ask him. He tells me the story of the inevitable summer storms passing through the area, and how the seedlings, with their superior root system, withstand the wind whereas many of the rooted cuttings will simply be uprooted by the big winds. 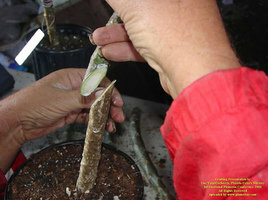 He generally grafts the cuttings onto seedlings grown from a variety that, in his opinion, has the best root system. Here a tray of Moonlight seedlings is ready to be potted up into individual pots. These will be used for next year's grafting projects. After a cold drink, the best part of the day arrives: shopping. You can take their catalog, and go down the rows of plants and pick your preferred plants, but personally I let Luc or Carol tell me what he has new in stock and which ones he feels I should have. He knows my taste by now!! 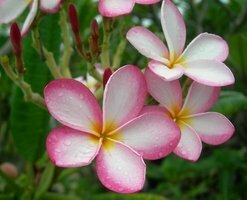 For people new to growing plumeria he recommends buying cultivars that are known to be good performers, or have exceptional scent, such as the beloved ‘Vera Cruz Rose', a best seller. 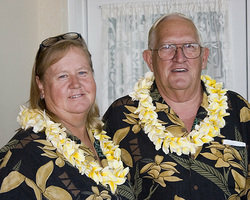 How do they see the future of plumeria growing? Florida Colors Nursery and several other notable nurseries are busy trying to hybridize more dwarf varieties, so people with limited space can enjoy the blooms (these are TREES, after all.) 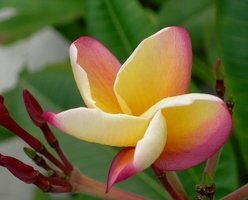 There are some evergreen plumeria varieties that would appeal to the many snowbirds in the warm parts of the country; they often shy away from planting plumeria because they are not at their best in the winter, so hybridizers are trying to find a way of creating more evergreen cultivars as well. 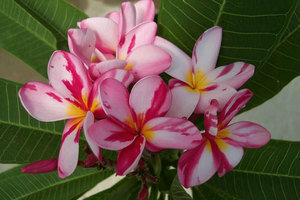 I know I will be back to visit Homestead again before long to get my next 'plumeria fix'. All pictures were taken by me, except the one of Luc and Carol which was supplied by Carol. 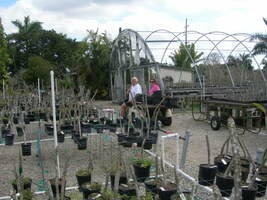 I visited Florida Colors Nursery in Homestead in the early spring, so most plants were still dormant and had no leaves. In the summer this is a mass of green and color. Dutch by birth but widely travelled since my late teens. Married for 27 years with a son in college, and living in sunny Southwest Florida, I now call myself 'semi-retired' so that I can justify spending all waking hours in the pursuit of growing blooming tropical plants, most specifically Plumeria.